I can see the light at the end of the tunnel now… only a few classes left until I’m done with my degree! Woohoo! 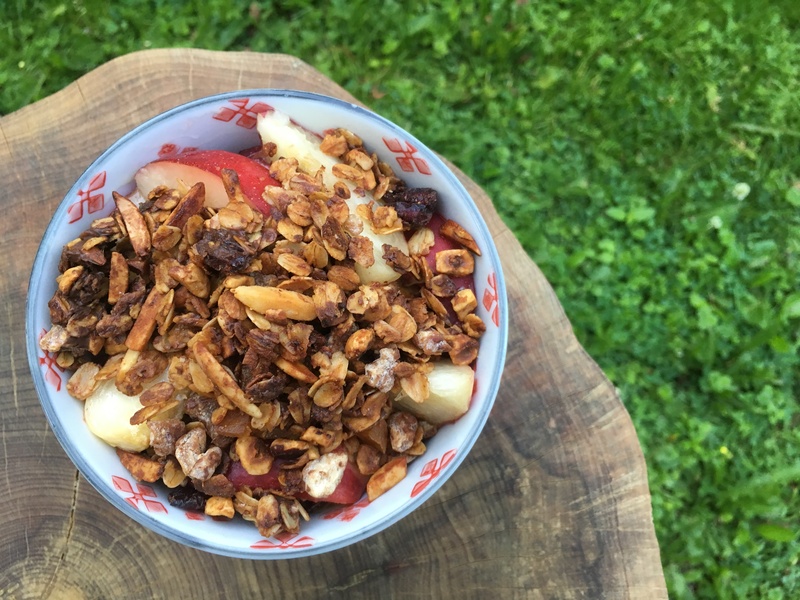 In the meantime, I have found a quick and easy breakfast that I love – Greek yogurt with homemade granola. Granola is so easy to make, and you can customize it every time. Sure, it’s easy to find in the store, but making it yourself is very satisfying. This recipe makes plenty and it stores well in an airtight container in the cupboard. Don’t like yogurt? 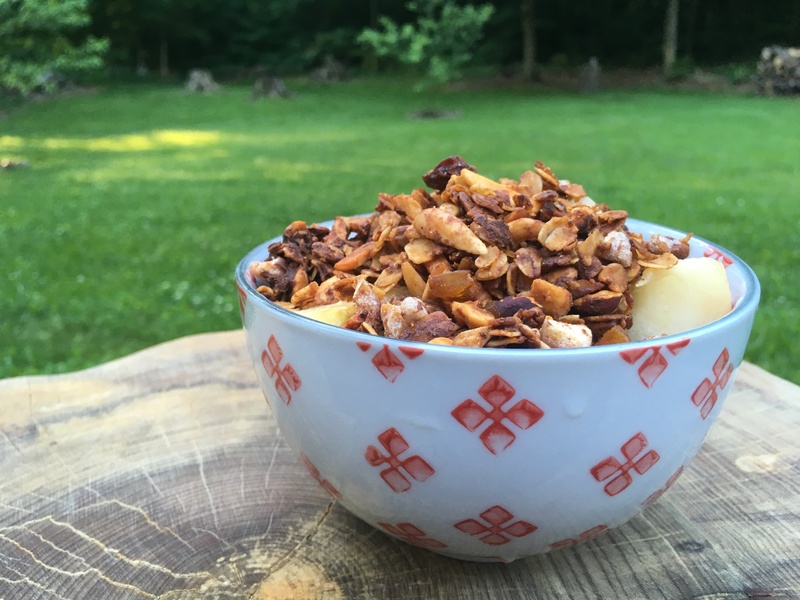 This is great enjoyed in any way you would eat granola – trail mix, a handful in morning cereal, go crazy with it. I have made this recipe several times, and of course every time was different so I learned a lot from the experiments. As long as the nuts and oats ratio is the same every time, this recipe works well. Keep an eye on it in the oven to make sure the honey does not burn. The granola in the photo is a bit darker than it should be, due to my oven being especially hot and me forgetting to account for that. The photo version has chocolate chips, raisins, dried cranberries, slivered almonds, hazelnuts, and cinnamon. Chocolate Granola – Mix in chocolate chips after taking the mix out of the oven, but while it’s still warm. The chips melt and will coat all the other ingredients. Yum! Almonds – Slivered almonds work wonderfully. I found that sliced almonds turn into little daggers in the oven and make the granola quite painful to eat… so I’d recommend sticking with slivered or chopped. Coconut – The original recipe is from Sustainable Baby Steps and includes coconut. That was a bit too chewy for me, so I go for all oats instead. You can replace up to 2 cups of the oats with shredded or flaked coconut for a more tropical granola. Spices – Any of the baking spices work well in this recipe, such as cinnamon, cardamom, ground ginger, or nutmeg (a little goes a long way). 2 cups nuts: slivered almonds, hazelnuts, etc. Toss the oats and nuts together in a large bowl. Whisk together the oil and honey in a small bowl. Pour the liquids over the oat mixture and stir until all oats and nuts are coated. Remove your homemade granola from the oven and allow it to cool, stirring occasionally. It will get crispy as it cools down. Add dried fruit, cinnamon, and chocolate chips. Store in an air-tight container. This entry was posted in Brunch and tagged beginner-friendly, dairy-free, vegetarian.